Unbeatable Squirrel Girl isn’t just an honest-to-god delight, it loves poking fun at Marvel Comics’ past. The series is getting a brand new original graphic novel, which just so happens to be a wonderful homage to a classic Punisher tale, too. 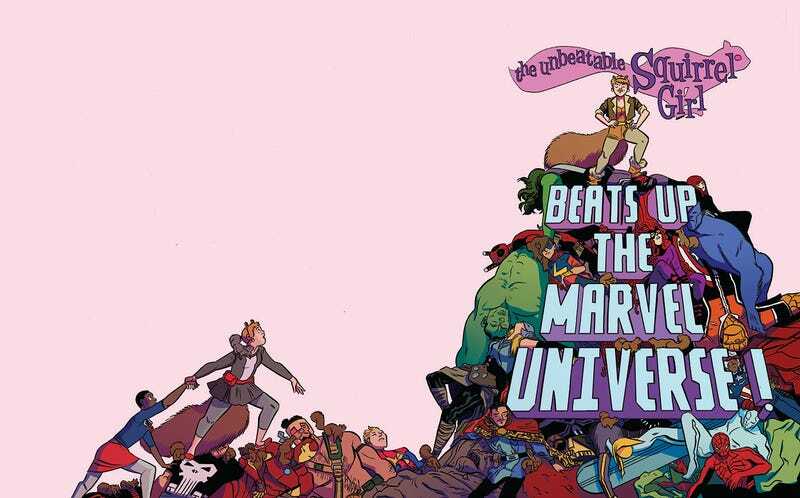 Announced at C2E2 over the weekend, The Unbeatable Squirrel Girl Beats Up the Marvel Universe comes from the same creative team behind Squirrel Girl’s excellent ongoing series, Ryan North and Erica Henderson. It’s clearly inspired by the original Punisher Kills the Marvel Universe comic, written by Garth Ennis and illustrated by Doug Braithwaite. Now, if you’ve read any Squirrel Girl comics, you know she has a penchant for trumping even the most powerful opponents pretty easily, so taking on the entire Marvel universe shouldn’t pose too much of a problem for her. This is going to be fantastic. The Unbeatable Squirrel Girl Beats Up The Marvel Universe is due for release in October.